Antigua & Barbuda is a twin island country lying between the caribbean seand and the atlantic ocean. Antigua was first discovered by Christopher Columbus in 1493 and later became a British settlement and naval base. The country is a exotic paradise of beautiful over 300 white beaches, turquoise waters, coral reefs, tropical islands with lots of luxury resorts. Tourism is a key industry driving 60% of GDP. Antigua is a member of the United Nations (UN), the British Commonwealth, Caricom and the Organisation of American States (OAS). Antigua has population of 85,000 and its currency is Eastern Caribbean Dollar (ECD) pegged to USD and official language is english. The threshold for the National Development Fund (NDF) option has been reduced by 50% from US$200,000 to US$100,000 for a family of up to four persons, and from US$250,000 to US$125,000 for a family of five and over. Two (2) applications from related parties can make a joint investment, with each applicant investing a minimum of US $200,000 in order to qualify. All processing and due diligence fees remain unchanged. The Government of Antigua introduced the fourth University of West Indies Fund (UWI fund) option after a cabinet decision is currently open for applications effective from Oct 12, 2018. Foreigners can qualify for Antigua citizenship by making $150,000 one time contribution to the UWI fund. One member of the family will be entitled to scholarship for 1 year (tuition only) at the University of the West Indies campus. The Regulations under Section 6 of the Citizenship by Investment Act, 2014 allow the government to operate a CIP program, under which citizenship is granted to persons who qualify under criteria set by parliamentary decision. Antigua CIP requires a person to make a significant economic contribution to the Country. In exchange, subject to stringent application and background checks, the applicants and their families are granted lifetime citizenship. Antigua is currently one of the best economic citizenship program among the Caribbean countries. Lifetime citizenship with one time investment. Fast processing time 2-3 months. No personal visit to Antigua required. Choice of real estate or business investment. Passport issued with 5 year validity. Family and children under 26 years can apply for citizenship. Visa free travel to UK, Ireland, Switzerland, EU schengen over 130 countries. No interviews, business experience or language tests. Passport pickup through agent or at consulate. Maintain dual citizenships with other nations. No wealth, inheritance, foreign income, personal income taxes. The Citizenship by Investment Program (CIP) was established following parliamentary assent to the Antigua and Barbuda Citizenship by Investment Regulations 2014. The Regulations regarding Citizenship by Investment in Antigua and Barbuda are contained in Section 6 of the Citizenship by Investment Act, 2014. These provisions allow the government to operate a program under which citizenship is granted to persons who qualify under following criteria set by parliamentary decision and the Citizenship by investment unit (CIU) handles all applications in Antigua. The threshold for the National Development Fund (NDF) option has been reduced by %50; from US$200,000 to US$100,000 for a family of up to four persons, and from US$250,000 to US$125,000 for a family of five and over. Antigua is the only country besides St lucia that offers business investment option with a direct path for citizenship under CIP. All four investment options are subject to government processing and due diligence fees (see below). The Antigua passport will be valid for initial period of 5 years and will be considered for renewal subject to the recipient having spent a total of 5 days in Antigua and Barbuda, since gaining citizenship, within the 5 year period. The passport does not afford automatic voting rights and persons would need to qualify as outlined in the Representation of the People Act. The passport is revoked after 5 years if the 5 day requirements of visiting the country is not met. The new university campus is expected to bring economic benefit to the country and will inspire many youths to pursue tertiary education. USD 150,000 for a family of four (4) or more (i.e. minimum number of persons per application is 4). USD 2,000 for dependent children between 12–17. Bitcoin and other cryptocurrencies are accepted for Antigua citizenship by investment program, according to a decision recently announced by Government. The granting of citizenship is at the sole discretion of the Antigua and Barbuda government and council of ministers. Nationals from restricted country list published by the Government (North Korea, Somalia, Yemen). The real estate market is on the expansion as lot of construction projects has been happening lately such as South point hotel, Sandals beaches resort, Beau panel 5000 homes, Singulari mega resort (647 acre with $1 billion investment). IMF report says the market will grow by 2.3% in 2016. The prices of 2 bedroom houses average around $420,000. Gross rental yields average around 4% and peak seasons 5% ROI. In 2009, the Antigua and Barbuda government signed a visa waiver agreement with the EU which allows an Antigua and Barbuda citizen to visit the Schengen countries without a visa for a period of three months within any six month period following the date of first entry into any EU country. There are no capital gains or inheritance taxes in Antigua & Barbuda. Personal income tax was abolished recently in the country. The business and corporate tax rate is 25% of net profits, although attractive concessions are available to qualifying companies. Property tax is levied on all properties in Antigua but not in Barbuda. The taxable value is based upon the property’s current market value construction replacement cost with the applicable tax rate dependent upon the classification of the property (residential or commercial). These are the documents which must be kept ready, when applying for citizenship. For children, 18-25, proof of education such as school or university letter showing full time studies. NDF Escrow Agreement confirmation of investment. copy of duly executed real-estate contract (Purchase and Sales Agreement), copy of duly executed escrow agreement. ** Documents originating outside Antigua and Barbuda must bear Apostille seal. What is the Antigua passport ranking in the world? The passport ranks No.25 in the world and No 3 in the Caribbean, No 1 among countries offering caribbean citizenship programs. Antigua passport has visa free travel to 134 countries in the world according to henley restrictions index 2016. Also country has no visa free travel to canada among other CIP passports. Is the name change allowed? Which is the best option for Antigua citizenship – donation or real estate? Currently over 90% of our clients go with $200,000 donation route, because real estate investment is too expensive for them ($400,000). But with real estate investment you wont waste your money and you can sell off the property after 5 years and you get back $400,000. Can i visit Canada and USA using Antiguan passport without visa? Can i visit UK using antigua passport without UK visa? Are there any residency requirements? Just 5 days. This is only needed when renewing your passport after 5 years. Do i need to give up my existing citizenship? Antigua & Barbuda has no restrictions on dual citizenships. However your home country may prohibit it. Countries such as India, Saudi Arabia, China, Russia do not allow dual citizenships. Can i visit Schengen countries with Antigua passport? Family members and dependents including children, aged over 65 can be included in one citizenship application. Parents or grandparents of the main applicant or his or her spouse above the age of 65 years living with and fully supported by the main applicant. For the purposes of the Antigua and Barbuda Citizenship by Investment Program ‘child’ means a biological or legally adopted child of the main applicant, or of the spouse of the main applicant. What are the countries in the Restricted country list? As an exception, nationals of the above-mentioned countries who are lawful permanent residents of Canada, the United States of America or the United Kingdom, will be allowed to make application providing that their status as lawful residents is established. In addition, all applicants will be required to fully comply with the Programme’s due diligence requirements. Antigua and Barbuda Government has taken this position to safeguard the integrity of the Antigua and Barbuda passport and ensure that only persons whose past behaviour will not threaten the very well-being of the Citizenship Programme, can be accepted. Recently the CIP unit approved two Iraqi nationals living in Saudi Arabia, because of their economic activity outside of that country. How to start the application process? You must apply for Antigua CIP through authorized agent. Antigua CIP unit does not accept the applications directly. We work with many government authorized agents in the island for CIP. You have to pay 10% of Government fee as initial deposit to start the process. Do i need to come to Antigua to for the application process? Do i get my money back if the application is not approved? Yes, your main investment will be refunded by the Government should they chose not to approve your application. In most cases only after receiving letter of approval from the government, you will need to do the investment. Where to obtain police certificates in canada? There are two national police certificates available in Canada. One is a name and date of birth check through the Canadian Police Information Centre (CPIC). The other a certified criminal history check conducted by the RCMP Real Time Identification system (RTID). It must be less than 6 months when launching the citizenship application. Do i need visa to visit Antigua and Barbuda? If you hold a passport from country which has visa waiver agreement with Antigua, you dont need a visa. For other countries you may obtain a Visa waive on Arrival provided that they hold one of the following valid travel documents at a cost of US$ 100 valid for 30 days. What is the validity of Antigua and barbuda passport? Antigua has no capital gains, gifts, wealth, estate, personal income and inheritance taxes and income generated outside of the country is not taxed. Do i need an address in Antigua? Do i need visa to visit Antigua ? Yes, you are welcome to visit the beautiful country and have a look around. You can also meet various real estate developers. Please check the visa requirements (http://www.immigration.gov.ag/visa-services/countries-exempt-from-visa/). If you hold the following you can get visa on arrival in Antigua by paying $100. Are there any interviews or tests? What documents are generally required for the application process? Police certificate from all countries where you have stayed more than 6 months in all countries. Must be less than 6 months validity. Proof of payment of relevant investment fees. Affidavit of Source of Funds. Notarized copies of University/College diplomas. All original documents originating outside Antigua must bear apostille only then it is acceptable. What if i dont visit Antigua for 5 days? You wont be able to renew your passport after 5 years of expiry. Do i need to make the investment again when renewing passport? No, you just have to pay $300 passport fee and show your “Certificate of naturalization” as proof of citizenship. What are the qualifying real estate investments for CIP? $400,000 in real estate projects approved by the Government. You can buy a condo, villa, share in a hotel or resport. Do business investments qualify under CIP? $1.5 million USD in approved business projects as a single investor or a joint business investment of atleast $400,000 per person, totalling total $5 million in whole. What is the time taken by CIP unit for approvals? within 90 days sometimes faster 70 days. Does the Antigua government publish the names of investors who are approved for passports? We are expecting a new baby and can for the baby get citizenship of Antigua? Is the due diligence carried out for children? Children above 12 years must go through due diligence and background checks. Dependent children under 11 requires no due dilgence but requires a sworn affidavit from parents and there is no due diligence fee to be paid. Do children need HIV clearance and medical tests? All children must undergo medical tests and HIV clearance. What are the additional fees involved on top of investment amounts? Can i apply directly to the Citizenship unit in Antigua (CIU) without involving agent? No, CIU does not accept applications directly. It must go through authorized agents. How is the real estate market in Antigua and barbuda? Can i live and work in Antigua and Barbud with the citizenship? Yes you will get full residency status with the right to live and work in Antigua. What are the main qualifying requirements to apply for Antigua CIP? Must not be a threat to safety and integrity of the country. What is the difference between Antigua and St Kitts passport programs? Antigua processing time is much faster than St kitts. The costs are almost the same. Antigua has visa free travel to 134 countries, while St Kitts has 132 countries. Antigua has visa free travel to Canada while St kitts does not. St kitts passport has 10 year validity while Antigua passport has 5 year validity. Please see: http://bit.ly/1syeud2 for more comparison. Can an adult child aged 28 apply for citizenship under family? No, children who are adults under age 26 studying in a college or university fulltime can apply under family application. If not they can apply as dependents but must pay dependent fees or under a separate citizenship application. Why there is a 5 day residency requirement? 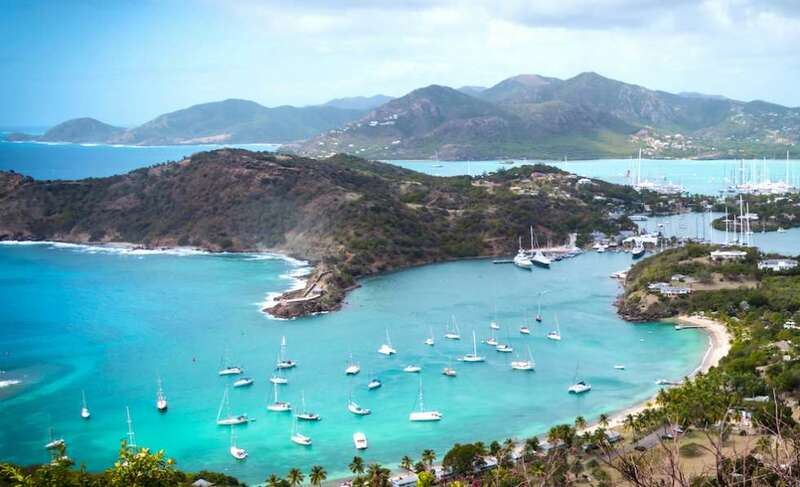 Government of Antigua & Barbuda imposed a 5 day residency requirement by amending citizenship laws. Initially you can get passport valid for 5 years without even visiting Antigua. The issue comes only at the time of renewing your passport after 5 years. You must have visited Antigua for 5 days, if not the passport wont be renewed and investment wont be given back. Antigua is really beautiful has white beaches and turquoise water and you should spend your holidays atleast once here. Does the passport give me voting rights in Antigua and Barbuda? No. The Antiguan passport under CIP does not afford automatic voting rights and persons would need to qualify as outlined in the Representation of the People Act.